Keck Medicine — substitute this boldface for what's there now —Specialists throughout USC Keck Medicine, led by speech and orthopedics, are helping musicians, dancers and other performers stay on the job in the face of injury. This appeared in USC Trojan Family Magazine. JAVEN SMITH WAS singing for hours a day preparing for a major role in a USC production of the musical Songs for a New World, known for its vocally demanding score, and he felt fine—until his voice went out. "A week before opening, I couldn't do all the things I'd been practicing," says Smith, a junior majoring in popular music. "I couldn't make the high notes." His vocal coach in the USC Thornton School of Musicreassured the worried singer that a doctor could help. Smith turned to Keck Medicine of USC, where otolaryngologists, physical therapists, orthopedists and other specialists understand and treat the special needs of musicians, singers, actors and dancers. Smith was afraid that he had irreparably damaged his voice, but Keck Medicine laryngologist Lindsay Reder, an assistant professor of otolaryngology and an expert in caring for vocalists, reassured him that a virus had only temporarily immobilized his vocal cords. She advised him to rest his voice and modify his performance. "I was able to get through opening night," Smith says. Getting sick or injured can threaten the career of a performing artist. In recent years, singers from Adele to Sam Smith have had to cancel tour dates due to voice problems, while actors on elaborate sets have fallen and broken bones on stage or during filming. Among performing artists and professional athletes, some 4.7 people in every 100 were injured in the U.S. in 2014, the latest figure available from the Bureau of Labor Statistics. But artists can get specialized help quickly through resources like Keck Medicine's USC Performing Arts Medicine Center within the Department of Orthopaedic Surgery and the new USC Voice Center in the USC Tina and Rick Caruso Department of Otolaryngology—Head and Neck Surgery. 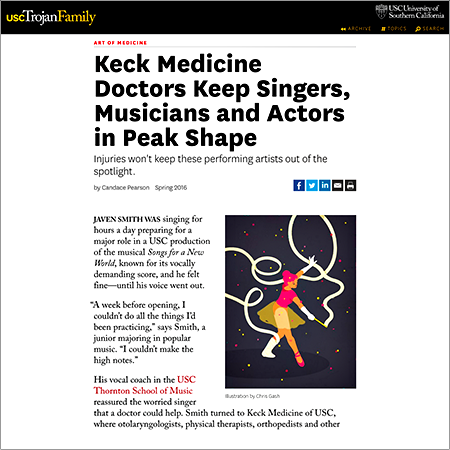 Keck Medicine physicians draw patients from USC Thornton and the USC Kaufman School of Dance, the Los Angeles Philharmonic, LA Opera and Los Angeles Ballet, as well as quartets, bands, musical theater actors and soloists. Art as Sport: In the USC Performing Arts Medicine Center, orthopedic surgeons apply their extensive experience in sports medicine to the arts. "We understand the education and training needed to excel as a performer," says Jay R. Lieberman, chair of the Department of Orthopaedic Surgery. "We have made a commitment to evaluate performers quickly and get them back to performing as soon as possible."